1-b Although some compounds act as donors of a species with an NO+-like character (i.e., are nitrosating agents), NO+ does not exist as such in aqueous solution. 1-c NO reacts with the superoxide anion to form peroxynitrite. 1-d In some conditions, S-nitrosothiols may also contribute to the NOx measured by chemiluminescence. ↵2-a Previously used alternative abbreviation. 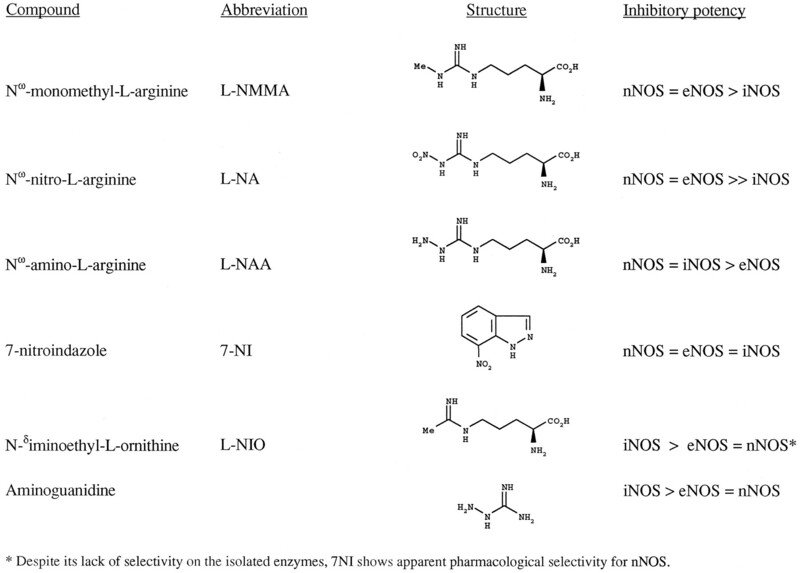 ↵2-b All three isolated purified isoforms of NOS have comparable specific activities. Output in this case refers to differences in levels of enzyme expression and in duration of activation in the in vivo situation. ↵3-a Examples of accession numbers: eNOS -M95296; nNOS - U17327; iNOS - X73029.